Our latest Blog-module makes the task even easier and more fun; this is only the beginning as we intend to expand and improve the blog dramatically - specifically in the Frontend. Also, the new templates for displaying articles and for the navigation are now available as well. The new module will be online in the first week of November 2016 - maybe even on the 1st of November! Unfortunately the blog is limited to a width of 740 pixels. Let us assume, the image has a width of 1,950 pixels. 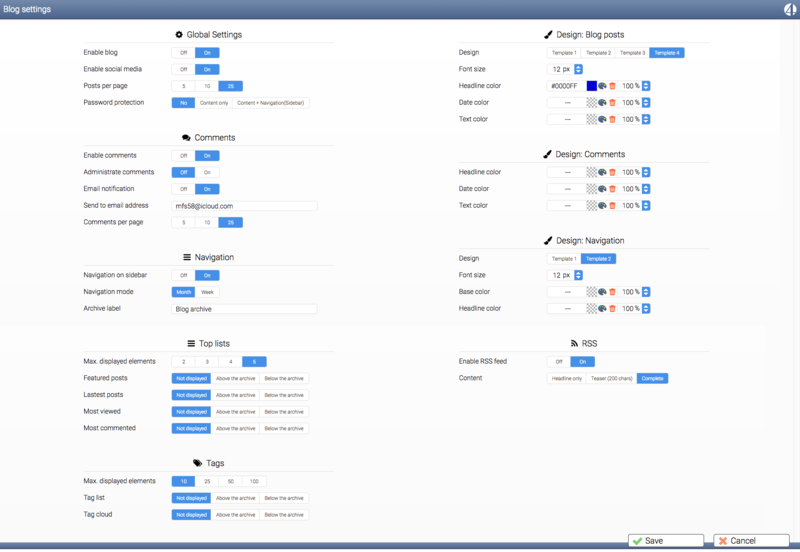 Similar as with the Page-management, you may use the entire width of the monitor. Click the image to view it in its original size. You have a lot of space and can see everything at once; we will offer more Online help ASAP. Listed below is a summary of many functions. As you can see, there are many markers on the screenshot. The area on the left always offers access to all articles and all comments for which we offer a number of options. On the right, you have different options, depending ons your selection. 1) Clicking it will display all types of entries; drafts, planing, as well as published articles. If you have more than 200 articles, only the first 200 latest articles will be displayed. You can adjust the time frame on the upper right (B). For example, you may select to view all articles from May 2015 or from June 2016. etc. 2) You will see all published articles that are visible to you visitors. 3) All new drafts are collected here - each new article starts out as a draft; the date does not matter. 4) Planned articles - all articles that have been published for a future date, which will be published automatically when on respective dates. 5) You can mark articles as ‘Recommended”; all such articles are stored here. 6) All deleted articles are moved to the trash with the option of undeleting them whenever needed until you empty the trash. 7) All tags are listed here. 8) All comments are stored in these 2 trays. The ‘Comments” area shows all arrived comments and the “Waiting for approval” area contains all articles that you must approve manually. 9) The “Options” area contains the blog settings. Simply click an entry and a window will open that shows your access to the entire blog. 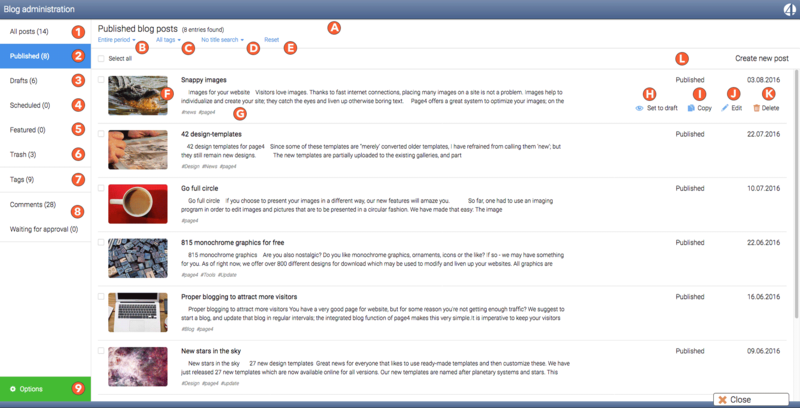 You can activate a blog, decide which navigations will be shown, which templates is to be used, etc. A) This is an info bar above the articles which updates automatically. B) You may view selected articles by time frame. C) Allows searching for key words - only articles which contain that key word will be displayed. 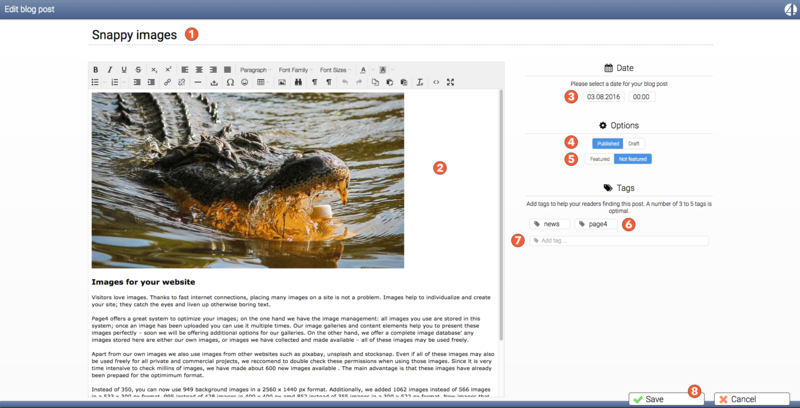 This tool is inter-active; as soon as you enter a letter, all tags which contain that letter are shown. You may then narrow the search by further entering letters, or you may select desired tags from the list. D) This tool is used to search blog titles only - no search is done within the blog text. E) You can reset all options with a single mouse-click. F) The preview will display the first image in the article; if no image is found, a standard image is displayed. G) The first words of an article are shown here. Line breaks are removed to ensure a quick overview over the current article. H) Every article may be set to ‘Draft” manually. Any previously published articles will then become invisible to your web visitors. J) A double-click on the article will launch the text editor. Alternatively, you may also click the link to one the editor. K) Any deleted articles are moved to the trash and will remain in there until the trash is emptied. L) This link will open a new and empty article. Every article has a preview left of the selection box. You may select multiple articles at one time, edit them, delete them, copy them etc. At the very top a check box “Select all” is shown which allows a quick selection of all articles. An additional click removes the last selection. The new Blog-module now contains Tiny MCE, with which you are already familiar. The window will always jump to the maximum browser window size. The width of the editor is limited to 1000 pixels. You may enter a title at the top (1) - without a title, the article cannot be saved. The right shows all options for the blog article. 3) A time stamp is added to each article. You may overwrite that date. If the article has been marked as “Public” it will be automatically stored in the “Planned” folder and published automatically. 4) “Draft” is the default classification of all articles. We do this so no unfinished articles can accidentally be published. Click “Publish” once the article is ready and seal be made visible. 5) You can ‘Recommend” articles and have them displayed in the navigation. 6) All article tags are shown here. Moving the mouse over an article allows you to remove it by an “X”. the tag will be removed from the article but not deleted. More info on tags can be found in our Help area. 7) Here you may access all available tags, or can create new ones. Clicking on ‘Cancel” will result in any changes being deleted without further warning. Please use with care. Below is the options dialog. We will refrain from individual explanations, since all will be available in our Online-Help shortly. Most options are self-explanatory anyway. I really hope you like the new Blog-modul as much as we do. We spent several weeks investing a lot of time and work to accomplish this, while making sure that any previously generated data will work just as well with the updated system. Luckily we have customers that heavily use blogs; have a look at this german page: http://www.hjkc.de . About 7000 articles have been published there since 2011; it really pays off to be active. Around 400,000 visitors have been on this page; when reading the comments one will find that this page is well known in the industry. Even cosmonauts and astronauts know this page! Google likes it when you publish new info one a regular basis; use our Blog-module for this! we have many advantages: other than our competitors, we have a REAL blog. This implies an automatic and time-dependent blog-navigation in which all articles are classified. You may display several previews such as “Most viewed articles” and below each article you may add a ‘social share’ tool bar as well. As mentioned, we will continue to expand our blog with function that you will love. We use the blog ourselves and thus have a personal interest to keep own improving this tool. We will inform you as soon as the new blog-module is available. One last thing: Once the new blog-module is active, all you need to do to access the blog is click “blog” - all additional menu entries will be removed.